Challenge 24: Create or join a Professional Development group. With so many educators already using Edmodo, it's not surprising that many teachers are using Edmodo for their Professional Development (PD). Edmodo is also the perfect platform for collaborating with other educators and sharing resources / best practice. Thankfully, there are a number of PD groups that have already been created 'by teachers for teachers' on a wide range of subjects. Can’t find a group that interests you? Why not create your own group! Select the 'Create a Group' button towards the bottom of the groups list. Enter the information and click 'Create'. If your group spans multiple grade levels, click 'Range' and then set the range of grade levels. Invite other teachers to join the group! Locate the '6-digit group code' and give it to other teachers for them to join your Group. Posting in the 'Communities' about your new group can be a good way to generate interest and attract teachers. 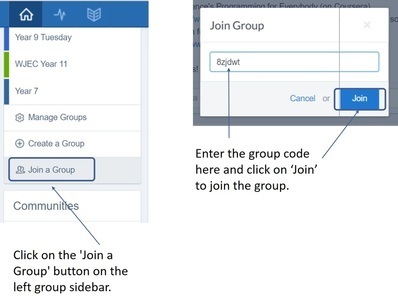 Top tip: If sharing publicly, share the 'join group URL' rather than the 'group code', for safety purposes.